84" & 96" Working Widths: Covers tire tracks and allows user to cover large areas in less time. 35-80 Tractor HP Range: Fits many tractors with a Cat. l or Cat. ll 3-point hitch. Quick Hitch Compatible: Fits Land Pride Quick Hitch for a quick and easy one person hook-up. Retractable Parking Stand: Keeps frame off the ground and makes hook-up easier. 2 1/2" Pivot Shaft: Heavy-duty shaft. Heaviest in its class. 16 1/2" Rake Height: Can move a great deal of material. 5/16" x 1" High-Carbon Spring Steel Teeth: Sized to eliminate premature bending and tooth breakage. Constructed of materials that have “memory” to spring back to shape. Rake Angle 5 Positions: Versatility in operation. Vary how much material to move. Rake Offset 7 Positions: Versatility in operation. Allows the unit to work closer to objects on the side the rake is of set towards. Dual Gauge Wheels (Accessory): Gives operator better depth control. Wide & narrow wheels available. Flip-Down Grader Blade with End Plates (Accessory): Enables the rake to perform light blading duties for moving and leveling dirt as well as other materials. Grader blade can be flipped up when not in use. 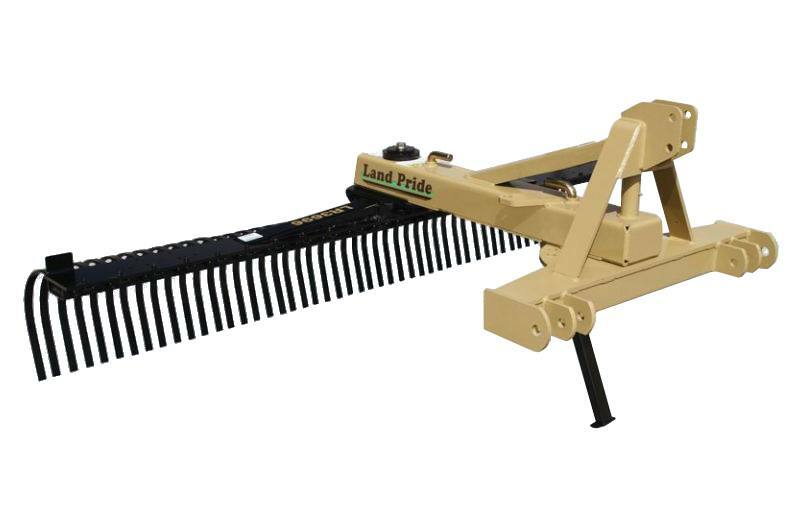 Rear Blade Attachment (Accessory): The rake assembly can be removed from the main frame and a Rear Blade attached to give the Land Pride Rake versatility. Hydraulic Angling (Accessory): Allows operator to change rake angle from the tractor seat. Pivot Shaft Diameter: 2 1/2"
Dual Gauge Wheels* (Accessory): Dual Narrow Width Wheels 13" x 4" x 6" or Dual Wide Width Wheels 13" x 6.5" x 6"